Uses larger diameter 1350 U-Joints (included). *30 spline upgrade for JK Dana 30 with aftermarket locker only! **Also fits JK Dana 44 with custom aftermarket axle housing swap (e.g. Terraflex/ Currie/ Dynatrac) WITH aftermarket, 30 spline locker. Want stronger U-joints that are still suitable for use without manual hubs? Nitro Excalibur Heavy Duty Chromoly U-Joints For Jeep Wrangler JK & JL are now available. Similar heavy duty Chromoly solid body design to our other competition/off-road Excalibur line of Universal Joints, but better suited for dual-sport use, as they feature needle bearings for longer wear resistance. Considerable stronger than the OEM Universal Joints, but wear longer than non-bearing type off-road-only joints. Nitro 1541H steel and 4340 alloy & chromium and molybdenum alloy axles commonly known as "Chromoly": Our OE replacement axles are made of 1541H steel for a 25-35% increase in strength over their stock counterparts. 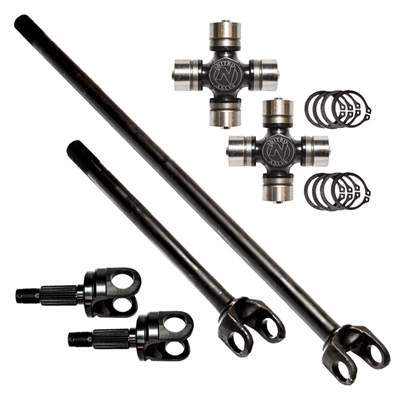 Nitro 4340 Chromoly axles are also heat treated but are designed with extra material for strength where it's needed. All of our axles are precision machined to OE specifications for excellent fitment. 4340 Chromoly steel, is a lower carbon steel with a minimum of 10% chromium by weight. Known as a high strength, low carbon steel with a tensile strength of 228,000 psi opposed to OE standard 1040 steel with a tensile strength of 110,000 to 130,000 psi. That means they take more punishment, to get you further down the trail or off the trail entirely. That's Nitro Tough.